“What’s explained can be denied, but what’s felt can’t be forgotten” — Charles Bowden. Jonna McKone’s work explores the way traces of the past become extensions of the present, sometimes grafted onto places or personal stories in ways that remain unseen, hardly seen, misunderstood or buried. With a sense of place and research, her work aims to explore the connection between land and memory, testimony and history, and the ways documentary art is as much about the struggle of individuals to tell stories — as the story itself. 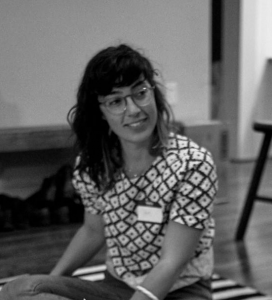 Jonna earned her MFA in Experimental & Documentary Arts from Duke University in 2014 and her BA from Bowdoin College. Her thesis films Yields and For The Time Being explored absence in a medium that so often expresses presence: an experimental observational film examining economic vestiges embedded in gesture and landscape in a rural region of North Carolina; a film that winds between her father’s archives, collective family memory and slippages in understanding across generations. While at Duke, she also worked with photography, oral history, sound, community-based art-making, archival materials and printmaking. Her film, photography and audio works have been installed in film festivals museums, galleries and national memorial parks. She was a 2015 Skidmore Storytellers’ Institute Fellow and her current film is part of the Saul Zaentz Innovation Fund in Film and Media Studies. Jonna is working with the Price Family Fellows at Rutgers University. For more of her work, see her website.